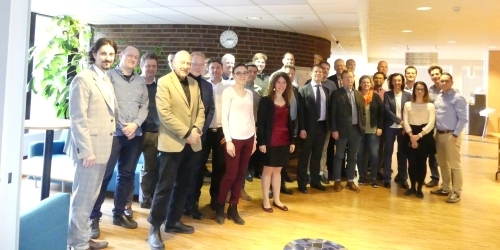 After 6 month since FUDIPO project kicked off, the consortium gathered past 2-4th May in Västerås (Sweden), with the aim of following and presenting the work done in the project and visiting two of the five study cases in FUDIPO: Mälarenergi (pulp and paper industry) and ABB (biological waste-water treatment plant). During the first and second day, interesting presentations and discussions about machine learning, demonstrators, technology and project development took place, while the third day was saved for the visits. At ABB, partners attended an interesting presentation about “the future of control room” by Lena Nyberg and took a walk through the facilities. After, at Mälarenergi the partners walked through the waste combustion/biomass fired plants.